A disorganized office can cost you time and energy when you are trying to get your work done. A good cleaning can make your office feel like new and add a little inspiration to help you make it through a long work day. Here are some tips to help you get started. 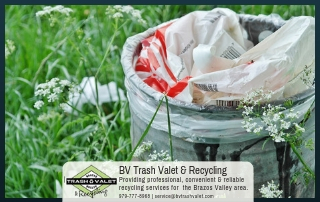 Start by emptying out any waste paper baskets or other sources of trash. 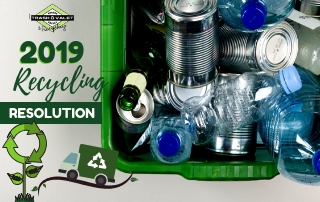 Don’t forget to go green and get your recycling taken care of too. Gather up any cardboard, or paper for the recycle bin. 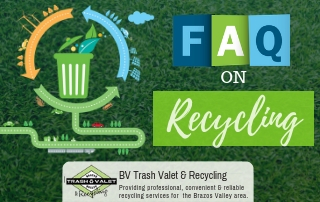 Take advantage of residential trash pickup in College Station, TX. 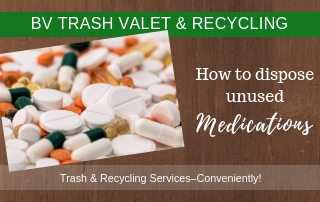 Also, don’t forget to set aside any items you can reuse or repurpose elsewhere in your office. Remove loose items from your desk and shelves and then clean them with a vacuum or cleaning pad. Be careful about using dusters that will just spread the dust around your office instead of actually removing it. Make sure to dust off any books or binders you use in your office and do the same for your computer desk. Clear off your lamp and writing paraphernalia and wipe your desk off too. Many people don’t realize just how much dust can accumulate on and even inside their computer. Clearing away this dust with a vacuum or a can of compressed air can make your computer run more efficiently so it uses less energy and even lasts longer. Clean your LCD monitors with a cleaning fluid that’s made for them and a very soft cloth. Kits that come with wipes and sprays are available that will make your monitor look like new. If you have old computer equipment, be sure to recycle any components that might be reusable. Finally, remember to clean your keyboard and mouse. These are probably the biggest carriers of dirt and even germs in your office! Many keyboards actually have removable buttons that are easy to pop off. This makes wiping down your keyboard really simple. Just be sure you know how to put them back in the correct order! If you can’t remove the buttons from your keyboard, be sure to turn it upside down to shake out any particles. (Tip: If you ever spill your coffee on your keyboard, flip it upside down to avoid permanent damage!) Then use a Q-tip to get between the keys. Alcohol is a safe cleaner to apply with the Q-tip. Most computer mice can be disassembled and cleaned. Most office chairs are in need of some dusting and cleaning. You can wipe down vinyl or leather chairs and vacuum chairs covered in upholstery. The legs and wheels are easy to forget too since you rarely notice them. If your chair has wheels and you find it hard to roll from one place to another, a new set of wheels might fix that. Most just pop out and are easy to replace. Once your office is clean, it will be a lot easier to focus on your work.